that results in fine quality grapes. In classical times Pausanias referred to the villages of Aegialia as ideal for the cultivation of grapes. Characteristics: White yellow colour, green apple and pergamonte flavour. Full mouthfeel with crispy acidity. Combination: A perfect accompaniment to fish, seafood, pies and white meats. Best served at 8-10c. Aged until two years. 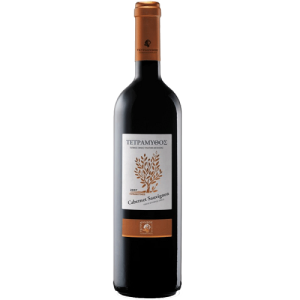 Wine Region: Patras lies on the north coast of the Peloponnese and this wine is grown in the vineyards that surround the town of Patras itself. 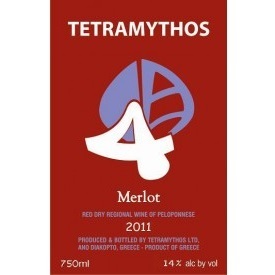 Wine Producer: Tetramythos is a boutique producer, working only 14 hectares of vines. Those vineyards are organic and lie between 600 and 1,050 metres above sea level. Grape Variety : Black of Kalavryta. Characteristics : Vivid ruby colour, cherry, stawberry and leather flavours. 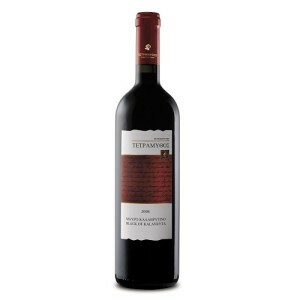 Gentle with integrated tannins and attractive finish. 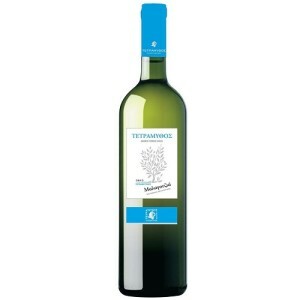 Combination : A perfect accompaniment to fish in the oven with red sauce, pastas, light meats. Best served at 15ο C. Aged until five years. 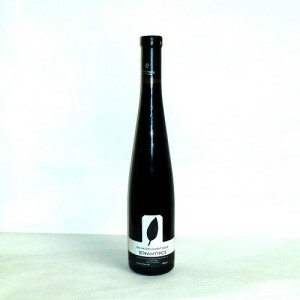 Organic certified red dry wine. Vivid ruby color, cherry, strawberry and leather flavors. 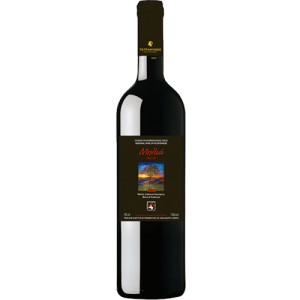 Gentle with integrated tannins and attractive finish. A perfect accompaniment to fish in red sauce, pastas, and light meats. Characteristics : Deep red colour, small red fruits, herbs, pepper and vanilla flavours. Combination: Ideal for res meats, game and yellow cheese. Best served at 17ο-19ο C. Aged after long years. Characteristics : Deep red colour, red fruit, vanilla and butterscotch flavour. Full moutfeel with round tannins. Combination: A perdect accompaniment to meats, pastas and mediterranean cuisine. Best served at 15ο-16ο C. Aged until five years. Characteristics : Deep red colour with violete, cherry and prune aromas. Velvety and rich in mouth. Combination : A perfect accompaniment to red meats, pastas, grilled dishes and cheese. Best served at 16ο-18ο C. Agent until five years. 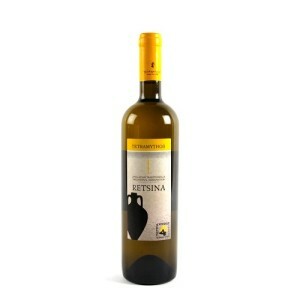 Characteristics : White yellow colour, jasmin and pergamonte flavour. Rich mouthfeel with crispy acidity and long aftertaste. Combination : Ideal as an aperitif and as a partnet to platters of fruits. 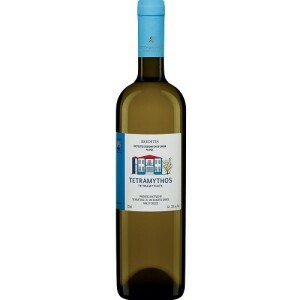 Best served at 8ο -10ο C. Aged until two years. Characteristics : White yellow colour, green apple and pergamonte flavour. Full mouthfeel with crispy acidity. Combination : A perfect accompaniment to fish, seafood, pies and white meats. 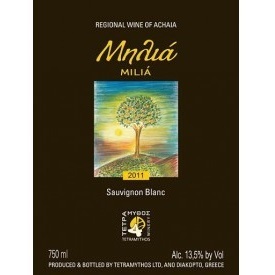 Wine from grapes of organic farming produced from northfacing vineyards at 810 meters altitude in mountainous Aegialia. Typical red vinification at 25 C.Use only the free run wine. Ageing in French oak barrels( of third use)225 liters for 6 months. Characteristics:Wine with deep red colour,red fruit ,vanilla and prune aromas.Full mouthfeel with silky tannins and vibrant acidity. Characteristics : Golden yellow colour, lychees fruit, vanilla and basil flavours. Full mouth texture with long aftertaste. Compbination : A perfect accompaniment to white meats, yellow cheese and chinese dishes. Best served at 9o-11o C. Aged until three years.